Sections of the M3 motorway in Surrey could have a 60mph speed limit imposed in a bid to improve air quality. The Highways Agency has launched a consultation, which if approved, would see the reduced speed limit affect a 2.8-mile section between junctions 3 and 4, between 7am-7pm, seven days a week. 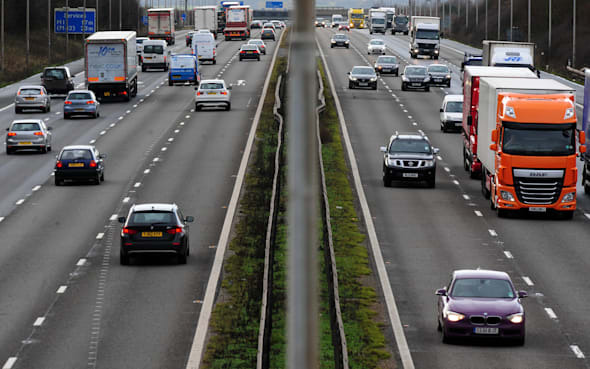 The Department for Transport body is already in the middle of a consultation for a similar speed restriction on 32-mile section of the M1 between Junctions 28 and 35a. The proposals come after concerns over rising air pollution levels in the area - following the conversion of the hard shoulder into a full traffic-carrying lane in a bid to cut congestion. The Highways Agency claims that even with the 60mph speed limit, the extra lane will ensure journey times are quicker during peak hours. It is hoped that the restricted speed limit could be lifted by 2019, as new cars become less polluting. However, motorists groups have warned that if accepted, the proposals would set the precedent for other areas of the motorway network where driving in the hard-shoulder is allowed. Speaking to the BBC, RAC technical director David Bizley said: "Given the landmark announcement in early January about a reduced speed limit of 60mph on a 32-mile stretch of the M1 in order to protect air quality in the area, this should really not come as a surprise. "It does, however, come hot on the heels of the first announcement and invites the question as to whether any of the eight other planned all-lane running, smart motorway schemes which the government have heavily invested in will also need to have reduced speed limits put in place to protect air quality?" Drivers and other parties wishing to voice their opinion on the proposed 60mph limit on the M3 have until April 11 to contact the Highways Agency.